In Chapter 5 of Lu Yu’s Classic of Tea, he lays out some guidelines on the proper preparation or boiling of tea. To make a good cup of tea, the first step is to toast the tea cake and wrap it in special paper. When cooled, the tea cake is crushed and passed through a sieve to extract only the finest powder. Lu Yu outlines how to select and boil the water. At a suitable point, the tea powder is added to the pot of boiling water. The tea is ladled into tea bowls to be served to guests. My understanding and translation of this chapter is assisted by the list of tea making equipment listed in Chapter 4 Part I, Part II and Part III. Lu Yu says that when toasting the tea cake over an open flame, it should be held as close as possible to the flame and frequently turned to avoid burning it. Beware a draft in the room: a flickering flame does not allow the tea to be evenly toasted. Once the tea cake is toasted so that it looks like the bumpy back of a toad, it has to be moved about 5 cun (寸, inches) away from the fire. The cooling tea leaves will relax and become loose after a while. When cooled, one should toast the tea cake again till all the water has evaporated (if the tea cake was previously dried by roasting) or till the tea cake is softened (if the tea cake was previous dried under the sun). The tea drunk in Lu Yu’s time (Tang dynasty) was unoxidised tea steamed and compressed into cakes. Lu Yu states that if tea is made from tender leaves, one must crush the leaves immediately after steaming. He says that, even after crushing, some of the round bits of tender stalks can remain intact. Even using a thousand jin (斤, jin = approx. 500g) hammer with brute force still will not crush these remnants! They’re like the seeds of the lacquer tree, very smooth and slippery – and when toasted, as soft and weak as a new-born baby’s arm! As soon as this kind of tea is toasted, it should be wrapped in “zhi nang” (纸囊, paper pouch) to prevent the tea aroma from escaping. Only when it is cold should one attempt to grind the tea in a “nian”(碾) to make it into powdered form. Lu Yu said that properly ground tea should be as fine as the best rice grain, whereas poorly ground tea looks like a water caltrop (a water chestnut). Note that the tea is not ground as finely as the matcha powder used in Japan but is passed through a “luo he” (罗合, a tea sieve). The fire for toasting tea should be fuelled by charcoal. The second best material is hard wood from the mulberry, pagoda, sycamore or osmanthus tree. Charcoal previously used to roast meat would be tainted with fat and is likely to produce an off-putting smell. Woods that secrete oily substances (cypress, pine or Chinese juniper) or decaying wood from disused wooden items should not be used to toast tea. Lu Yu comments that the ancient saying “Don’t use decaying wood as cooking fuel” could not be more correct! A piece of tea cake being toasted on a open fire;- can you imagine the fragrance that permeates the air! At the bottom of the picture is a stone “Nian” for grinding the tea. I did a blog post about using snow to brew tea earlier this year when London was in deep freeze. There I talk about the best water for brewing tea. 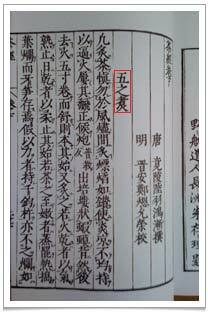 In Chapter 5, Lu Yu says that spring water is the best and river water second best. Water from a well is the worst. Lu Yu quotes from the ancient encyclopaedia “du fu” (荈赋, written around 250AD) which says Ming Shan (岷山, Mt. Ming in Sichuan province) produces the best spring water. He adds that the best and cleanest spring water flows slowly over granite or stone. Water from spurting springs or waterfalls cannot be consumed as people who drink this water eventually acquire illnesses of the neck. Water sources where many mountain streams consolidate may appear crystal clear but can contain a lot of scum and toxins because they are stagnant. This is especially so between the hottest summer and the arrival of frost. To extract water from this source, one must create an opening to allow the existing water to be replaced by fresh water. When retrieving water from the river, Lu Yu advises that one should avoid the crowded bit of the river but when extracting water from a well, one should seek out a busy well. While a river being full of people means that the water is unclear and possibly polluted, a frequently used well produces good water as more of it is being drawn from the earth. For me, this is just good old common sense. When boiling water, if the bubbles are of the size of small fish eyes (approximately 70-80°C) then Lu Yu called it “yi fei” (一沸, the first boil). This is now more commonly known as the ‘crab eyes’ stage. When the edge of the pot has continuous strings of bigger pearl bubbles, then it is called “er fei” (二沸, the second boil) also known as the ‘fish eyes’ stage. When the water is tumbling in the pot, it is called “san fei” (三沸, the third boil). Lu Yu says that if one continues to heat the water beyond san fei, then the water will become “old” (overboiled) and cannot be drunk. This concept of “old” water is an interesting one; if you continue to boil some mineral water, all you get is water that has a higher mineral content as the water evaporates away. He also says that at the ‘first boil’, one should add a little seasoning (salt) to the water. Any remaining water that has been retrieved for tasting should be discarded. Lu Yu says one should not simply add more salt if one thinks the water is tasteless otherwise one might as well be drinking salty water. At ‘second boil’ one should take a scoop of the boiling water for later use and using a pair of “zhu jia” (竹夹, bamboo tongs) stir the water creating a swirl in the centre of the water. Into this swirl, one should put in prepared tea powder using the “ze” (则 scoop). Within moments, the water will be boiling like a rough sea and will splatter. At this point one should add back in the scoop of water removed earlier. This way, the water will not overboil and will produce the essence of the tea and retain the bubbles created by the tea. Even now, the same technique is used to cook noodles to create a delicious al dente effect by ‘shocking’ the noodles with slightly cooled water. The foam or froth created by the tea is an important element in the enjoyment of this tea and this concept is still applicable to the Japanese tea ceremony and to the enjoyment of matcha tea brew. 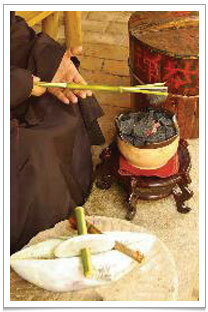 “Kao Cha” (toasted tea) – a Dai ethnic minority’s tea ritual in Yunnan. 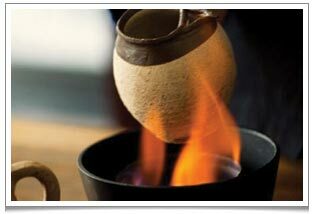 The pu erh tea is placed in the small clay urn and heated over an open flame. When there is a toasty aroma, the urn is removed from the flame and hot water poured into it. When the bubbling subsides, the tea is ready to be served. Before drinking the boiled tea it should be poured into a “wan” (碗, tea bowl), allowing the froth to spread evenly on the surface of the water. Lu Yu says that this froth is the essence of the tea. Thin froth is called “mo” (沫, the modern term for light froth), which he likens to the algae that float on the edges of a river or to chrysanthemum petals falling down on to one’s blossom. Very thin froth is called “hua” (花, flower). Lu Yu likens ‘hua’ to date flowers that have fallen into a pond and float slowly on the water surface, or to light clouds in a clear blue sky. Thicker froth is called “bo” (饽, now refers to steamed cakes or buns) and is produced by the tea scum. It is like layer of white snow accumulating on the surface. Lu Yu says that at ‘yi fei’, first boil, any moisture or water film layer (impurities) like black jelly fish should be removed as it will destroy the taste of the water. I imagine this is the kind of slightly slimy scum that is produced when one is trying to make a stock out of konbu seaweed by gradually bringing it to a boil. The first scoop of water taken from this pot is called the “juan shui” (隽水, ‘juan’ meaning ‘the best’) and is the most flavourful. Lu Yu says that juan shui is recommended in the ancient encyclopaedia du fu for using to calm a pot of boiling tea in order to extract the essence of the tea. Lu Yu then says that the second and third scoops of water are acceptable flavourwise but the fourth and subsequent scoops of water are only drinkable if one is dying of thirst! 1 “sheng” (升, roughly a litre) of water, Lu Yu says, can fill up to 5 wan. If there are more than 10 people, then one should add another stove for boiling tea. Tea should be drunk hot because any scum would have settled in the bottom of the wan and the essence of the tea would be floating on the surface. If the tea is cold, then the essence of tea would have evaporated together with the heat of the tea. Lu Yu says that tea is alkaline in nature. When boiling tea, one should not use too much water or else it’s too thin. Lu Yu remarks that the remaining half of tea will lack flavour so one shouldn’t get too much water to boil the tea. He describes the tea liquor as light yellow and very aromatic. If it is full of umami sweetness then the tea is “jia” (槚). If the tea is bitter then it is called “mao” (荈). If the liquor tastes a little astringent but the umami sweetness comes back into your palate then the tea is call “cha” (茶, tea). 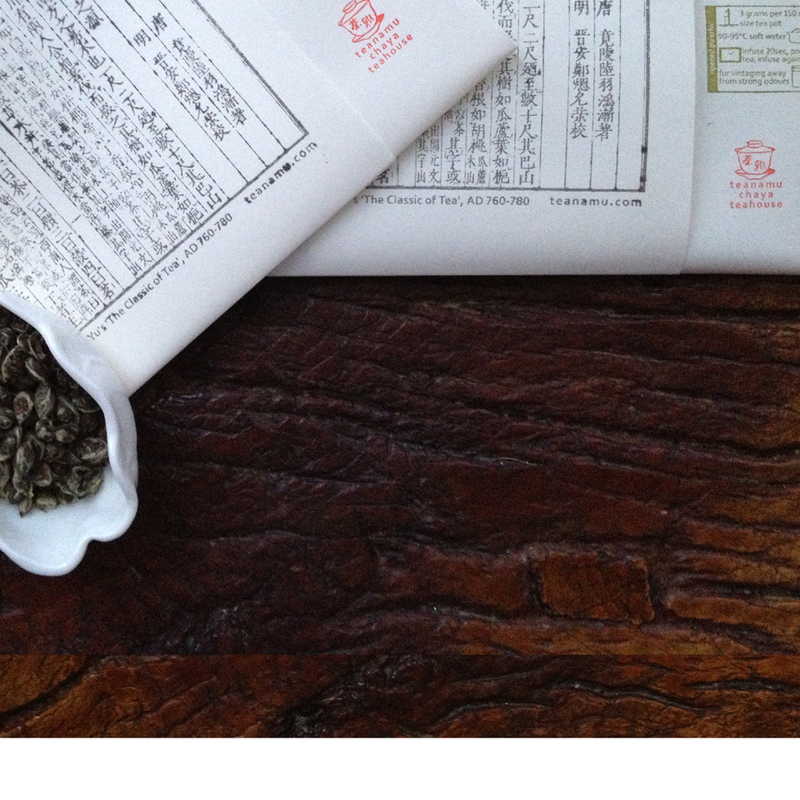 The “umami sweetness coming back into one’s palate’ is called “hui gan” (回甘) and is a much sought after quality of tea. Chapter 5 shows us how tea was toasted before boiling. The toasting of tea is still practised by the Dai ethnic minority today, as it brings out another layer of flavour. The “kao cha” (烤茶, toasted tea) ritual involves having tea leaves placed in a clay urn and the urn is held over a small open flame. Hot water is then poured into the urn causing it to come to a violent boil. When the boiling has calmed down, the tea can be drunk. I am waiting for suitable weather to do this outdoors. I hope you will join me one day! Thank you so much for this post! I just discovered (and Liked) your Facebook site for Lu Yu, and look forward to reading earlier posts. I have a request. Would you know where I could purchase a Kao Cha vessel?! My local tea shop has one they use occasionally that one of the owners brought back from Yunnan. She didn’t have a way to purchase one, but perhaps you do?! I would be SO grateful. Thank you so much for reading teanamu’s blog. I am very glad you like it. The kao cha （烤茶) vessel (better known as Cha Zhi 茶炙) can come in different forms. If you are looking to simply “toast” the tea cake (just like Luk Yu) then all you need is a pair of tongs and an open fire. If having you are referring to the Dai ethnic minority way of toasting a tea in a vessel and then brewing the tea in the same vessel, then any clay jar/urn that can withstand heat from an open flame will do the job. I suggest you try Indian shops selling little clay jar/urns that can be use as an alternative. I have only one such jar at the teahouse and plan to do an outdoor tea drinking session with my tea friends in Autumn this year. If you are in London, do pop by for a cuppa. I am planning to go to Yunnan next year, so can bring one back for you.